The developers responsible for a controversial development on 82nd Street have announced that they will withdraw their rezoning application and construct a smaller building as of right. 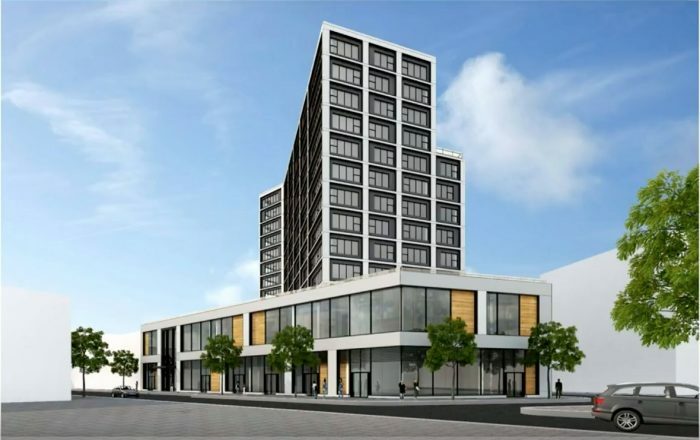 Sun Equity Partners and Heskel Group announced that they will withdraw their rezoning application, which would have permitted them to construct a 13-story, 120-unit building at 40-31 82nd St., the former location of the Jackson Heights Cinema. The developers will instead move ahead and construct the as-of-right proposal— a 9-story, 77-unit building which will not include affordable housing. Several stores, including a Target, will be located on the first floor. Prior to the developer’s announcement, it appeared that the rezoning application would be approved. Last week, the City Planning Commission— which has a binding vote on rezoning applications— approved the proposal, and the project was set to go before the City Council and the Mayor. However, Councilmember Francisco Moya— who had backed the project and was expected to get it passed by the City Council— abruptly withdrew his support from the proposal last week. Moya then asked the developer to withdraw the plan. The developers’ spokesperson Hank Sheinkopf released a statement soon afterwards. According to a report by Politico Pro, Moya decided to end his support for the rezoning after he learned that the developers intended to renege on their promise to provide a certain proportion of permanently affordable units in the building. Moya announced in May that he would only support the rezoning if the developers agreed to increase the number of affordable units in the building. Under the deal, 42 of the 120 units would have been deemed affordable, versus the 36 the developer initially proposed. Moya told Politico Pro Friday that the developers had decided to pursue their original plan of 36 after Moya pushed them to submit an affordable housing application to the city. He added that he had been reluctant to support the project from the start. Critics of the project, who include anti-gentrification activist group Queens Neighborhoods United, had campaigned for months to block the rezoning. They argued that the project would drive up real estate prices, bring new corporate competition for local businesses and clog the roadways with traffic. Assemblymember Aridia Espinal released a press release after the announcement lauding Moya for blocking the rezoning. Tania Mattos, a Queens Neighborhood United co-founder, said that she hoped that the developer’s decision would send a message to other builders. “This sets an example for developers that they can’t rezone in our neighborhood without a fight,” Mattos said. An activist from Queens Neighborhoods United criticized both Moya and Espinal on Facebook, arguing that the community— as well as Queens Neighborhoods United— had been responsible for ending the rezoning. “COMMUNITY pressure made this happen and community pressure will see it through. We will not let any politicians co-opt this cause,” Queens Neighborhoods United wrote. Queens Neighborhoods United also promised to try to undermine the Target planned for the development. Critics of the project have argued that the Target will take business from local shops. The affordable housing is for incomes of 80k and up in most cases. The below street level garage with 100 spaces would have been a disaster. This means the market is soft and we are heading into a recession. I’ve seen 20 units with over 60 days on market in Jackson Heights and 10k price drops to boot. The garage will still be there, just no affordable units. It is a victory, but much of what was objectionable remains. This is a “small” Target store in a very walkable and transit friendly neighborhood so it’s reasonable to think a store there would attract mostly foot traffic, including people using transit coming and going from work. The fact that all this parking is permitted in an already jammed up neighborhoods shows that changes in zoning rules for the areas are needed. That’s probably too late in this case, since Councilman Moya hasn’t returned phone calls to community groups. Instead, he sent a twitter message saying today’s hearing was off. For info I would stayed tuned to Queens Neighborhoods United; JHBG, which I’m representing, is also pitching in as is Queensboro Housing Association. so now we get less housing, at market rate. Thanks to our community for continuing the bottleneck of our city’s housing supply. Do you even live in Jackson Heights? You sound like a greedy gentrifying prick. For the most part the neighborhood is quiet, clean, culturally diverse, and has affordable rents and food. The last thing it needs are luxury condos to drive up rents and to line the pocket books of developers. Move to Williamsburg if you don’t like what current residents want here! Haven’t you seen the Third World along Roosevelt Ave? The community wants progress and development, whereas these radical Socialists/Communists want run down buildings, graffiti, crime, prostitution, and everything that keeps the community behind in a mediocre state. They should move to the Bronx. …except there is MUCH more to JH than the section under Roosevelt. You’re trying to kill a fly with a hammer with something that will ruin the rest of the neighborhood forever. You don’t like brown people? Move to another country. Usted no nos representa, hispanon resentido. You dont represent us, resentful Hispanic. I lived most of my life in JH and it is a disgusting place full of crime, prostitution and drugs. Yes, it is much better towards east elmhurst but stop fooling yourself and everyone else with your lies. What JH needs is new developments, new investments, not a resentful hispanc using the race card. I am Hispanic too but I care about my community and their future, not just my selfish political agenda. I would disagree with saying that block is clean. Activists may have thwarted rezoning, but lost affordable housing units. I’m for gentrification as it will improve the looks of that block. Do we have an radical socialist communists in Queens. Wow, TGhe president should know. I haven’t met anyone who isn’t against positive redevelopment. We just want our communities to be treated seriously, the way some neighborhoods in Brooklyn and Manhattan are, and not raped.